We are excited to announce the first review for our new album, Broken Ties. "We need more Vogts Sisters in this chaotic mess of a world. We need to step back and breathe and concentrate on the good and not the evil. We need to acknowledge beauty without argument, accept the good in life. Maybe what we need is less city and more mountain in our lives. One thing for sure--- we need more mountain music in our lives. What if I told you that some of the best mountain music you'll hear this year is coming from Kansas? I've driven through Kansas. Didn't see anything close to a mountain. 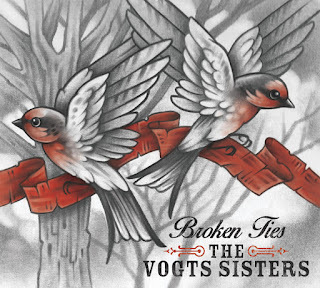 I suppose the music of The Vogts Sisters is not technically mountain music, though there is something about it that makes me think West Virginia, Virginia, and Kentucky. No twang to it, but just the same..."